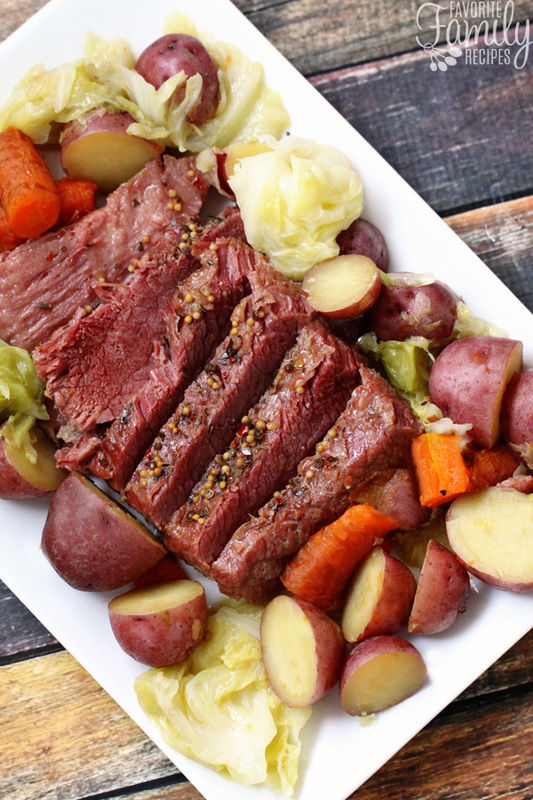 Instant Pot Corned Beef and Cabbage isn’t just for St. Patrick’s Day! Enjoy tender, tangy beef and flavorful cabbage any time of year with this simple and speedy recipe! 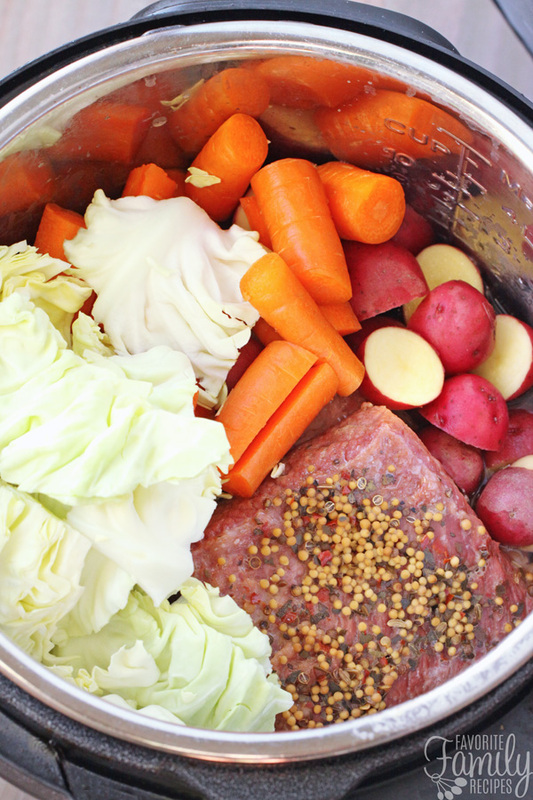 Instant Pot Corned Beef and Cabbage can be made in the fraction of the time it usually would take to make a good, tender corned beef. Cooking corned beef in a roasting pan or slow cooker can take up to eight hours to get the same results. Thanks to the Instant Pot, dinner can be on the table in mere minutes. I also love that with this recipe, you can pressure cook the vegetables in the same pot along with the corned beef. No need for dirtying more than one pot! 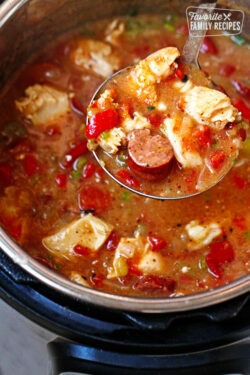 I love serving this on St. Patrick’s Day along with roasted red potatoes and a beautiful green salad. But it’s a perfect dinner for any occasion, even a random weeknight. Corned beef is a salt-cured type of beef brisket. The term “corned” has nothing to do with actual corn or any kind of corn product. It is called “corned” because the beef is treated with large-grained rock salt, commonly called “corns” of salt. It’s salty, slightly tangy, and absolutely delicious with mild cabbage and potatoes. Give it a try; I bet you’ll love it! If your kids are squeamish about trying new foods, try letting them dip their meat in honey mustard. It really complements the flavor of the corned beef. We love adding mini carrots and red potatoes in the instant pot along with cabbage. They cook up alongside the meat beautifully. You could add any other veggies you like! For added flavor, you can add onion to your recipe. If you decide to add onion, it would be wise to saute the onion for a little bit before adding it to the Instant Pot. With it only having 4 minutes of pressure, the onions likely won’t soften as much as you would like. To make this corned beef and cabbage gluten free, you will just have to make sure the beef broth you are using is GF. That is the only tricky thing in this recipe where gluten could possibly turn up. The corned beef and seasonings are all gluten-free so you should be good to go! 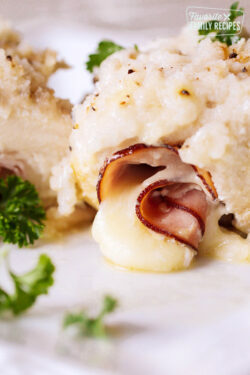 If you are looking for more Irish-inspired recipes we have plenty! From Irish Pasties to Irish Soda Bread to Irish Beef Stew, we have everything you need for a blow-out St. Patrick’s Day feast! This Instant Pot Corned Beef and Cabbage is delicious as a sandwich the next day too. 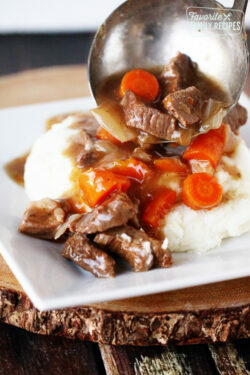 So many options if you are in the mood for a delicious, hearty Irish meal! 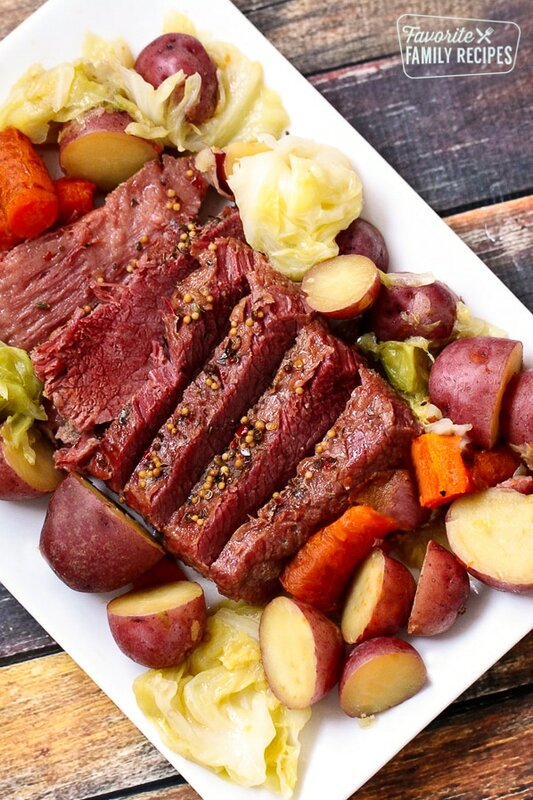 Instant Pot Corned Beef and Cabbage isn't just for St. Patrick's Day! Enjoy tender, tangy beef and flavorful cabbage any time of year with this simple and speedy recipe! Remove corned beef brisket from packaging and rinse well. Remove seasoning packet (if included) and set aside. Discard any remaining juices from packaging. Place corned beef in Instant Pot, fatty side down and add beef broth and crushed garlic. 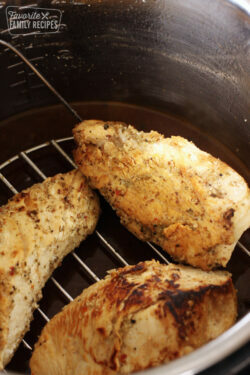 Open seasoning packet and sprinkle evenly over the top. Place lid on Instant Pot and seal. Set tab to "sealing". Push the "manual" setting, set to "high pressure" and increase time to 90 minutes. When time is up, do a quick release. Remove lid and add potatoes, carrots, and cabbage. Place lid back on Instant Pot, seal, and set to "manual" for 4 minutes on high pressure. Do a quick release and remove vegetables from Instant Pot with slotted spoon. Carefully remove corned beef and serve, spooning some of the remaining liquid over the top. The recipe ingredients list is missing the onions. The recipe actually doesn’t have onions as written. They are an “optional” ingredient mentioned in the above commentary. Hope this helps! I have the instant pot slow cooker not the pressure cooker. What changes do I need r ok make to cook it this way? Did not like how the potatoes, carrots, and cabbage was mushy in the end. Thinking too much liquid is put in. You only need to pressure cook the veggies for 3 minutes, not 4. It depends on how big your corn beef briskets are. It is usually best not to overcrowd if possible. If they are smaller then I am sure you will be fine. Hope this helps! Oh no! What size corned beef were you using?